Ben-Ari's party and Ha'am Itanu discussed joint list to avoid 'lost right-wing votes' - but a Yishai associate allegedly 'torpedoed' it. Former MK Dr. Michael Ben-Ari's Otzma Yehudit party and MK Eli Yishai's Yachad - Ha'am Itanu were in last minute talks Sunday night to form a joint list and ensure both parties don't miss out in the coming elections, but apparently those talks have fallen through, and Otzma Yehudit says a person close to Yishai is responsible. According to a source in Otzma Yehudit, both parties generally agreed on all the major issues that would allow them to run as a technical bloc for the elections and afterwards split while keeping their seats, with Yishai likely joining a Likud-led coalition and Ben-Ari being in the Opposition. "However, during the negotiations a representative from Yishai's Ha'am Itanu party surprised us and claimed the first four spots are already 'flooded' with knitted kippot (national religious Jews as opposed to haredim - ed. ), and there's no room for another knitted kippah in the first four," revealed the source. A point of friction in the last minute talks was that Ben-Ari requested the fourth and sixth spots on the list, as opposed to just the sixth spot, given that polls have shown without his party Yishai will not make it past the threshold for entering the Knesset, whereas the combined list would get a comfortable seven mandates. "We were very surprised by the allegations of these words that show a lack of understanding in terms of politics and simple mathematics," added the Otzma Yehudit representative, noting the polls showing Yishai's poor chances running alone. Given the refusal to give greater representation to Otzma Yehudit above the sixth spot, the party has said it cannot join in a technical bloc, and accuses an unnamed MK connected to Yishai's list, other than Yishai himself, as being responsible for the situation. According to the Otzma Yehudit source, "we were surprised that instead of showing responsibility, this MK ran from place to place, leaked inaccurate leaks, and tried to torpedo the negotiations by force." 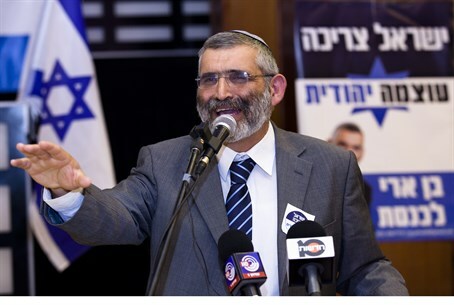 The unnamed MK allegedly said that another point of contention between the parties centered on Otzma Yehudit's insistence that Jewish access to the Temple Mount be a plank in the party's platform, but the Otzma Yehudit source says there is no disagreement on this subject, since Yishai's mentor, Rabbi Meir Mazuz, has already come out in support of ascent to the Temple Mount. "This Member of Knesset acted as if there was a lack of agreement in terms of the Temple Mount, whereas Rabbi Mazuz's opinions on the topic of the Temple Mount are known," added the source. The source added that "later on this (MK) source briefed journalists and claimed there is no feasibility that Dr. Ben-Ari will be on a realistic spot on the list, and even leaked from within closed meetings. This isn't how you do things." "We made very generous offers"
Attorney Itamar Ben-Gvir of Otzma Yehudit refused to respond to the issue of the MK who supposedly "torpedoed" the negotiations, but stressed "we came to the these talks with very generous offers, it's clear to everyone today that without the technical bloc Yishai won't make it past the threshold percentage." "We made a generous offer and in effect anyone else in our position would demand more than one realistic seat on the list, (demanding) also the second seat and not just the fourth - we're people of ideology and not seat-ology, and therefore we compromised on the spots as we did in the past with National Union," said Ben-Gvir. From Yishai's party, MK Yoni Chetboun, who left Jewish Home to join Ha'am Itanu (and is the only MK beside Yishai on the list), had sharp words about the negotiations. "We won't be dragged to the level of this goading discussion," said Chetboun disparagingly. "We have responsibility towards the nationalist camp and therefore to save the lost votes, we offered him (Ben-Ari) a reserved sixth spot." Glossing over the danger that Yishai's independent run will also result in "lost votes", Chetboun continued: "it's a shame he is refusing, insisting time and again to lose votes for the right. Right-wing voters should know and internalize that Ben-Ari's independent run is liable to bring a leftist government of Tzipi (Livni) - Buji (Yitzhak Herzog)." Regarding the issue of "lost votes," Otzma Yehudit has argued in the past that their ideologically-concerned voters will not have a party to vote for if they do not run, which would mean "lost votes" in any case, and that many religious Zionist voters disappointed with Jewish Home would also not vote at all without them as an alternative.